Maybe it’s a well-planned bit of scheduling. Or maybe it’s just the luck of the Irish as Chicago revs up for St. Patrick’s Day this weekend. Whatever the case, two shows about Irishmen who come together in their local pub – their best alternative to the psychiatrist’s couch – are now having at it in Chicago theaters. So lift a glass and make a toast to the musical and verbal talents of some Emerald Islanders who have arrived on the shores of Lake Michigan for brief stays. To cut to the chase: “The Choir of Man” is far and away the finest show to arrive on the stage of the Broadway Playhouse in many, many years. But wouldn’t you just know it, it’s only here for eight performances through Sunday. 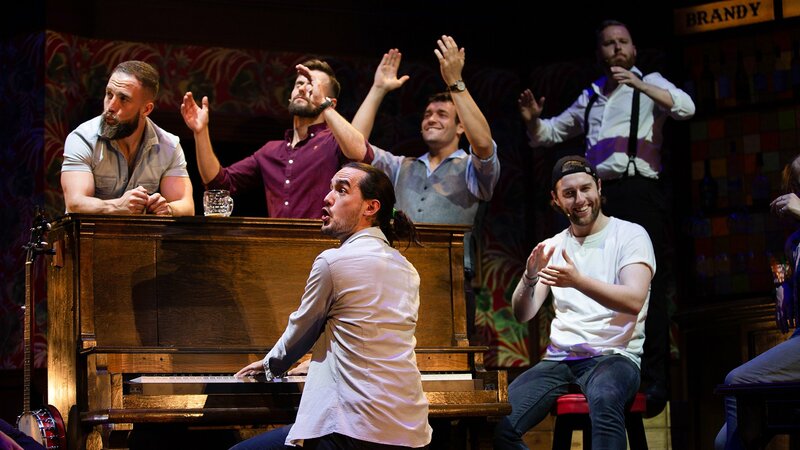 This brilliant production, featuring nine wildly talented, wholly engaging young guys with quick wits, playfully flirtatious ways, and great heart, could easily have enjoyed a long run. For not only can these performers sing (and conjure sublime harmonies with their sensational voices), but they can dance, act up a storm, and play a slew of instruments – from piano, guitar, ukulele and banjo to violin, accordion, bagpipe and more. Yet for some reason, Broadway in Chicago, which has never fully understood how to program this intimate Water Tower-area venue that sits in the very center of a major tourism district, has missed a rare opportunity to host a surefire hit. Maybe a return visit will be arranged. Imagine a mix of the musical “Once” and the percussion phenomenon “Stomp!” plus something of an inspired pop twist on The Three Tenors (with some excellent baritones, too), and you might begin to get an idea of what the show’s creative team – Andrew Kay, director Nic Doodson, writer Ben Norris, music arranger Jack Blume and choreographer Freddie Huddleston – have devised. The miracle is that they found these nine extraordinary lads who are now embarked on their first U. S. tour, and figured out a way to interlace their talents so that they connect to their audience in a way that feels totally spontaneous but clearly has been masterfully precision-tuned. Even a few brief but hilarious episodes of audience involvement work like a charm. The fanciful pub where the nine men gather is called The Jungle (given a fittingly rousing tribute by way of Guns N’ Roses’ “Welcome to the Jungle”), and is outfitted with a working bar, red floral wallpaper and brightly colored tiles (the work of set designer Oli Townsend). Overseeing the festivities is the Narrator (the easily charming Denis Grindel), who introduces the audience to his eight distinctive mates: Tapper (Matt Cox, who performs a sensational tap dance routine to Paul Simon’s rhythmic classic, “50 Ways to Leave Your Lover”); Bore (Andrew Bateup, who soars in a performance of “The Impossible Dream”); Hardman (the devilishly good Tom Brandon); Beast (Peter Lawrence, a superb guitarist); Casanova (the wily John Sheehy); Barman (Mark Loveday, who has his hand on the tap handle ); Piano Man (Connor Going, aptly dubbed the Rachmaninoff of the group); and Joker (the boyishly handsome Aidan Banyard). Along the way, bursting with buoyantly macho energy and full hearts, they sing an eclectic mix of songs, all featuring bravura vocal and instrumental performances, with extraordinary arrangements by Blume that include everything from a remarkable a cappella segment with nine-part harmony to a straight-out, power-voiced Broadway classic. A couple of lovely traditional songs also are sung along the way, including one that bids a warm goodbye to an audience that already is fully enchanted by these nine fellows, their tour de force musical mischief, and their embrace of all those who seek solace and camaraderie in a pub. “The Choir of Man” runs through March 17 at the Broadway Playhouse, 175 E. Chestnut St. For tickets ($39-$79) call (800) 775-2000 or visit broadwayinchicago.com. Running time is 90 minutes with no intermission. They are working class men in their sixties – a couple of old friends who alternately banter, argue, curse and confide in each other while seated on stools at their local pub. And they are played by a pair of veteran Irish actors – Liam Carney (the one with the egg-smooth bald head and a neat little beard), and Philip Judge (with a full head of dark hair), who make it sound as if they themselves were writing “Two Pints” on the spot, although in fact this is a play by Roddy Doyle, the award-winning novelist, screenwriter and dramatist. Of course, Doyle has a pitch-perfect ear for his characters’ turns of phrase and ways of thinking. And “Two Pints,” developed at Dublin’s Abbey Theater, directed by that fabled institution’s associate director, Caitriona McLaughlin, and subsequently “staged” at pubs around Ireland, now finds the actors at Chicago Shakespeare’s own in-house Pub for a brief (and sold-out) run. The three-part piece unfolds over a period of several weeks during which the character played by Carney is paying regular visits to his elderly, dying and much-beloved father in the hospital. Judge serves as his all-important sounding board and challenger. But despite all the diversionary local gossip, the hilarious, expletive-laced talk about social inequality, women, science, politics, drinking and Carney’s obsession with the shabbily casual attire of hospital car park attendants, the real subject of “Two Pints” is mortality and what happens to us when we turn to dust. Chicago Shakespeare’s Pub can pack in just about 50 people, and not every corner of the venue delivers equal audibility, especially in the first section of the play when a good deal of the conversation has the actors’ backs to the audience. (Laurence Lowry, the actor who serves as the silent, poker-faced bartender, probably hears every word with total clarity.) Things improve in the following two sections. And what we hear is a sort of 21st century riff on the human condition, and the inevitable march from being to nothingness. “Two Pints” runs through March 31 in the drink-dispensing Pub space at Chicago Shakespeare Theater, 800 E. Grand Ave. on Navy Pier. For tickets ($45-$52), call (312) 595-5600 or visit chicagoshakes.com. Running time is two hours and 15 minutes with two intermissions.